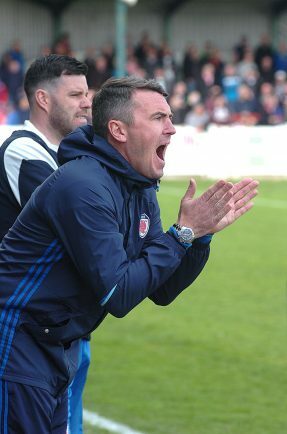 BROMSGROVE Sporting boss Paul Smith was left delighted with the sharpness of his squad after they thrashed Chelmsley Town 12-0 in their first pre-season friendly this week. Last season’s ‘Invincible’ Midland League Division One champions were drafted into training a fortnight earlier than usual and extra hard work in the intense summer heat has paid dividends. Wade Malley, Luke Edwards, Sam Wills and Chris Lloyd fired the Rouslers into a 4-0 half-time lead before Smith rang the changes during the break with nine substitutions being made. John Pykett, Chrisi Conway (2), Malley, Joe Ward (2) and Liam Spink (2) all netted after the interval to secure the double figures victory. However, Smith was more concerned about the lessons learned last night (Wednesday) than the scoreline. “It was a pleasing start to pre-season and having all those extra sessions showed in the performance,” he said. “We were quicker and sharper all over the park. “I gave the lads simple instructions to follow and there were a number of very good individual performances. “There were some mistakes and there were some issues but I expect that at this early stage. Sporting face a tougher test on Saturday when they travel to Northern Premier Division One South outfit Romulus. With only star striker Jason Cowley and defender Daniel Morris missing due to holidays, Smith has full belief in his squad to rise to the challenge before their away trip to Boldmere-based Paget Rangers on Tuesday night. “This squad can beat anyone at most non-league levels,” he said. “With the quality of players I have put together, if they do what they are told to do they will go far. With Sporting now officially able to register players, Robbie Bunn, Ward, Cowley, Conway, Reece Francis, Keenan Meakin-Richards, Lloyd, Hewitt, Malley, Aaron Roberts, Josh Quaynor, Duane Courtney, Spink, Wills, Wilson, Jordan Jones and Ahmed Ali have all signed. Defenders Edwards and Craig Jones will also be signing on to complete the 21-man squad. “I have spoke about cutting the squad down to 18 but it is practically impossible to get it down to that,” Smith said. “I explained to the players if they are happy to sign then it is down to them to battle it out for a starting place.